Some people are fantastic socialites, able to pull the attention of dozens of friends without fail and liven any party with their bright energy and enthusiasm; other people work in quieter realms, creating masterpieces in their solitude or confiding in a close relationship between a single best friend. Whatever may apply to you, our luxury one-bedroom apartment on Tempe Town Lake at the Vela have all the space and amenities you need to relax and play around with company, no matter how big it is. 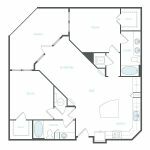 Our one-bedroom luxury floor plan, the A4, offers an incredible 905 square feet in living space, leaving more than enough room to openly stretch on the floor, host a nice holiday party or celebration, or any of your numerous hobbies. The bedroom can accommodate a plush king-sized bed, perfect for catching up on much-needed rest, and connects to its own deluxe bathroom – complete with a stand-in shower, soaking tub, and double vanity sink – and an expansive walk-in closet to organize your business and casual wear. 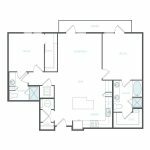 Cook up tasty party favors or succulent meals in the open concept kitchen, featuring plenty of pantry space for stocking dry groceries, a separate chef’s island to set out snack bowls or your coffeemaker, and ample dining room to set a nice table. Lounge back and relax, or socialize with your friends, in the wide living room, large enough for your comfiest couch, TV set, party games, bookshelves, and much more. Finally, take a breather and admire the sunrise or sunset from the private balcony. Enjoy the best of your life – however, you want to make it – here at the Vela. Visit our luxury one-bedroom apartments on Tempe Town Lake near Phoenix today and browse our one-bedroom floor plans, but act fast; there’s only one A4 model left to rent.